Almost a year after Girard-Perregaux unveiled the Tri-Axial Tourbillon complication in 18k pink gold (hands-on here), the company has just released its more modern twin in white gold. 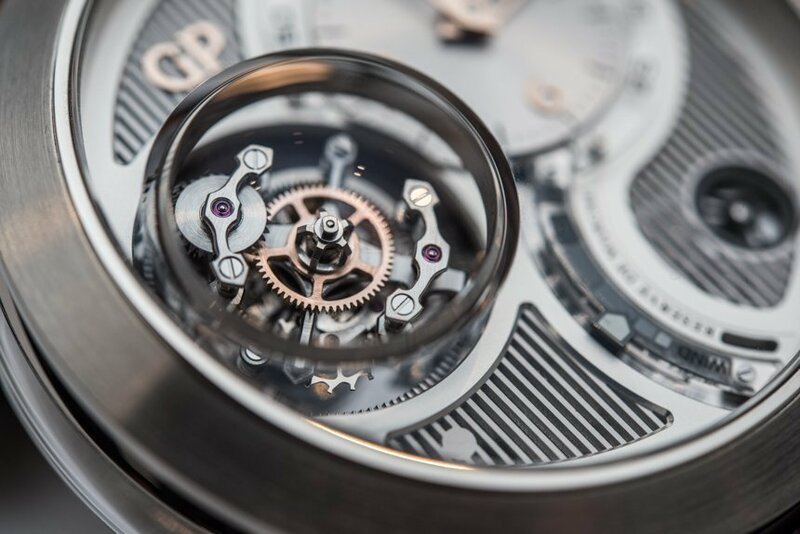 You may have missed last year’s quiet entrance as Girard-Perregaux placed much attention on the new Constant Escapement series; however, with the introduction of the timepiece in white gold, the focus is now once again on the Girard-Perregaux Tri-Axial Tourbillon. The 48mm white gold model, limited to only 10 pieces, exudes a look of scientific competency. Scientifically competent it is. 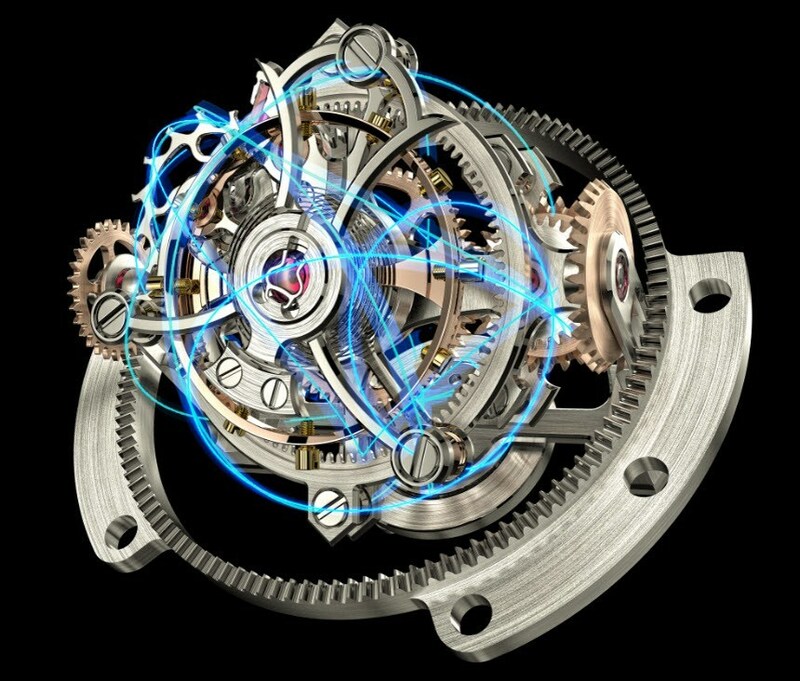 The Girard-Perregaux Tri-Axial Tourbillon is a complex lesson in physics (how about gyrophysics), tribology (yes that’s an “-ology” – principles of friction, lubrication, and wear), metallurgy (tourbillon cages must be strong, light, and resilient) and that’s only a start. The amount of scientific know-how required to create a functioning tri-axial tourbillon can fill walls of books or quite a bit of server space. In many tourbillon watches, the cage is placed at the 6 o’clock position, and the dial remains centered. In the Girard-Perregaux Tri-Axial Tourbillon collection, Girard-Perrregaux places the sunburst finish hour and minute dial at the one o’clock position, with the tourbillon to the 9 o’clock position. This allows for a clear time display as well as marked and well-earned tourbillon attention. Arching from the bottom of the dial face to the bottom of the off-centered time display is a power reserve indicator clearly labeled “reserve de marche.” The different shades of gray accompanied by red accentuation and prominent screws enhance the look of highly competent machinery. The rotation center of the power reserve hand is situated at the 5 o’clock position and moves with the power reserve indicator. The remaining dial area is covered by a vertical grid, revealing the underlying mechanism and adding to the more cutting edge, modern look of the white gold model. 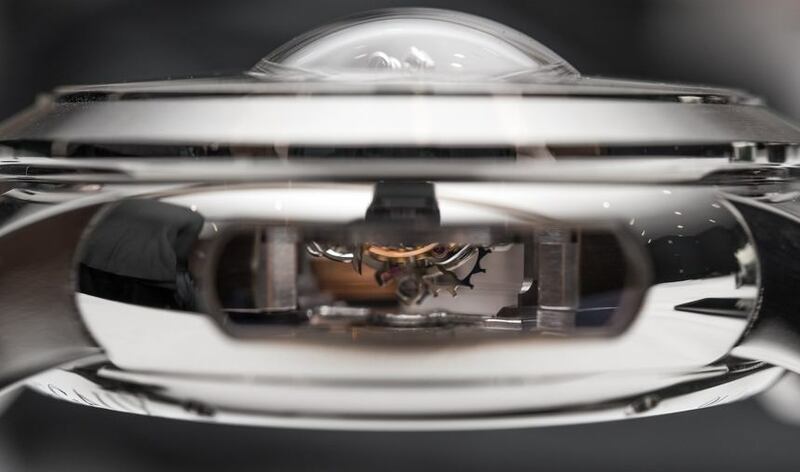 What is so complex about a tri-axial tourbillon, and why does the timepiece sport such an exorbitant price tag in the excess of half a million dollars? The tri-axial tourbillon adds a further degree of complexity to the Girard-Perregaux bi-axial tourbillon. 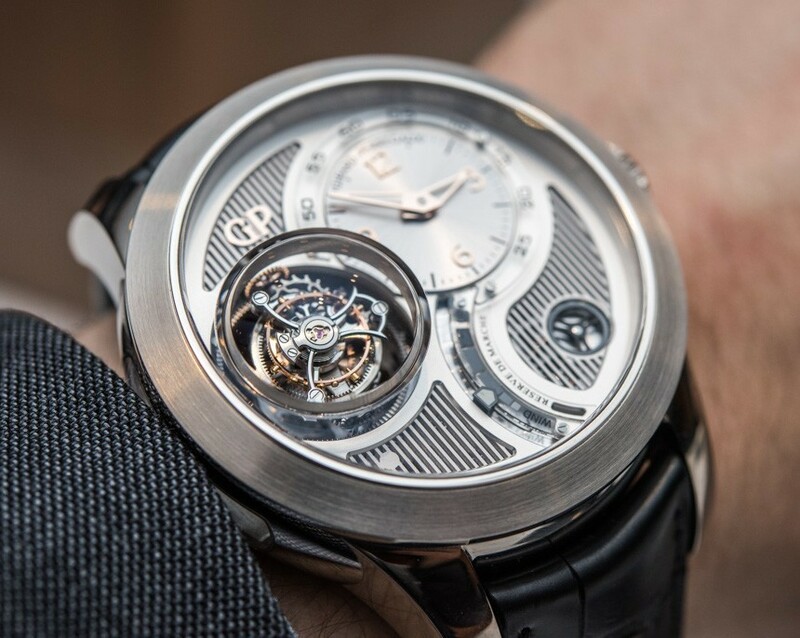 Whereas the escapement cage rotated on two axes within the bi-axial tourbillon movement, the tri-axial tourbillon, as the name suggests, utilizes three axes for the tourbillon’s rotation. 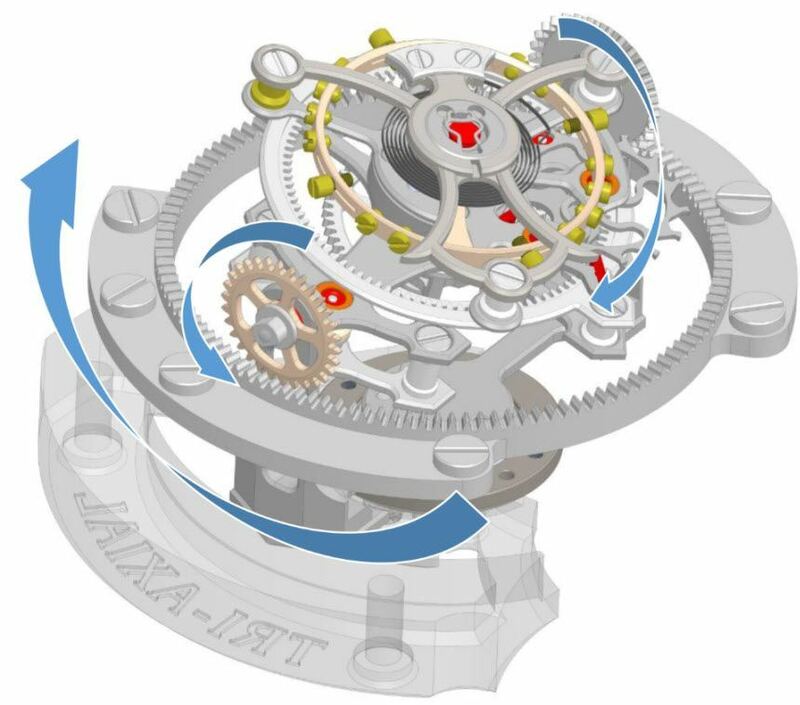 Each axis supports a different carriage rotating at individual speeds and performing different functions. The inner carriage is shaped like a lyre – that harp-shaped musical instrument found on ancient Greek mugs – housing the inertia balance and moving at the traditional one rotation per minute. This inner carriage is fitted into a structure which is supported by an axis which revolves once every 30 seconds. Finally the outermost structure encompasses both rotations, and it spins on its own axis once every 2 minutes. The entire mechanism of 140 components, some barely visible to the naked eye, weighs 1.24 grams and occupies 13.78mm. To provide enough space for the multiple rotations, Girard-Perregaux integrated a domed lens in the sapphire crystal above the mechanism. To view the mechanism in its entirety and from as many angles as possible, Girard-Perregaux created anti-reflective toric crystal window on the side of the manual winding watch below the 9 o’clock position. A sapphire crystal case back enables the view from behind. Originally, Abraham Louis Breguet created the tourbillon back in 1795 to counteract the effects of gravity on the escapement of the pocket watch while kept in a pocket. The theory was that the constant force of gravity pressed down on the regulating system of the movement and hampered its precision. Whether this is true or not, I don’t know. 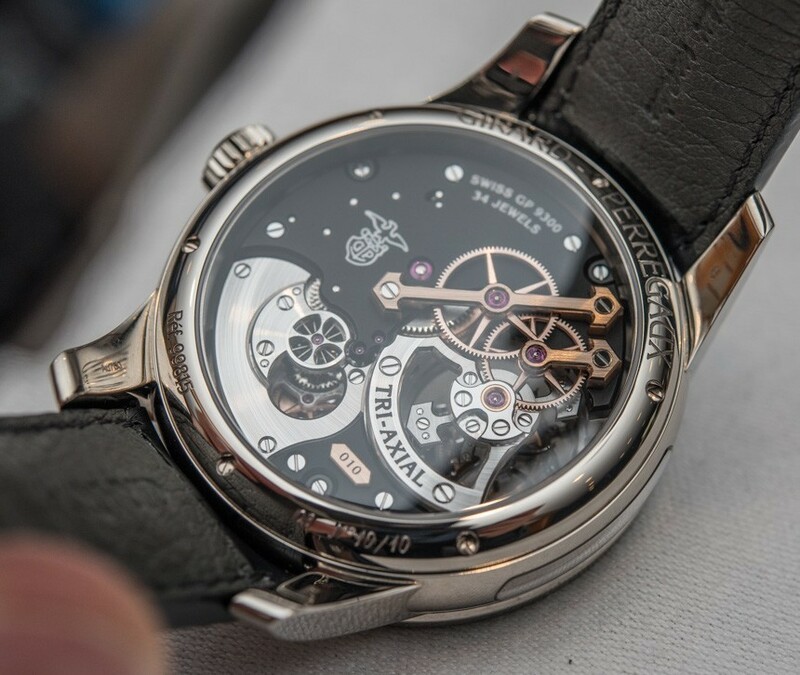 In any case, it does not really matter as the actual original purpose of the tourbillon is redundant anyway. The tourbillon has rather become a testament to exemplary craftsmanship. 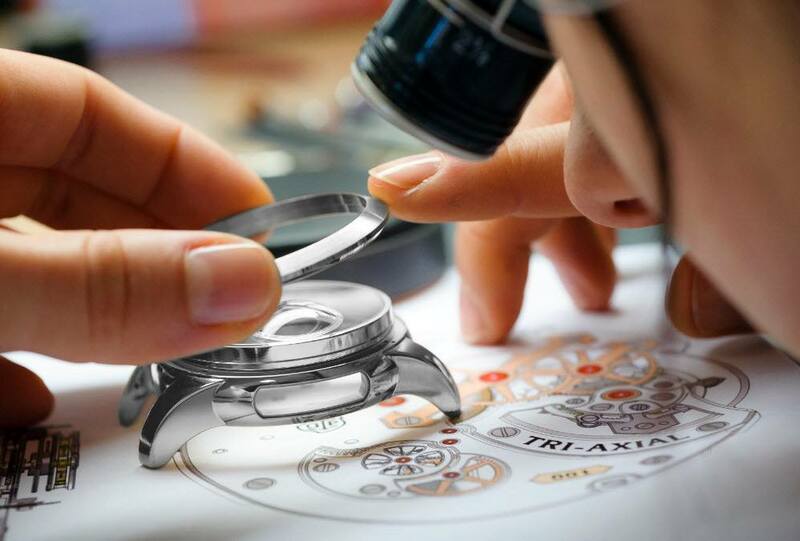 The more complex the tourbillon, the more credibility is given to the company. It is well known Girard-Perregaux has been at the forefront of the tourbillon rejuvenation. Although, the tourbillon is a common site in wristwatches, there was a great lull in the presence of this complication spanning many many years. I am sure a great watch historian would know the exact time frame the tourbillon was amiss; however, what I do know is that Girard-Perregaux played a large role in bringing the tourbillon back. 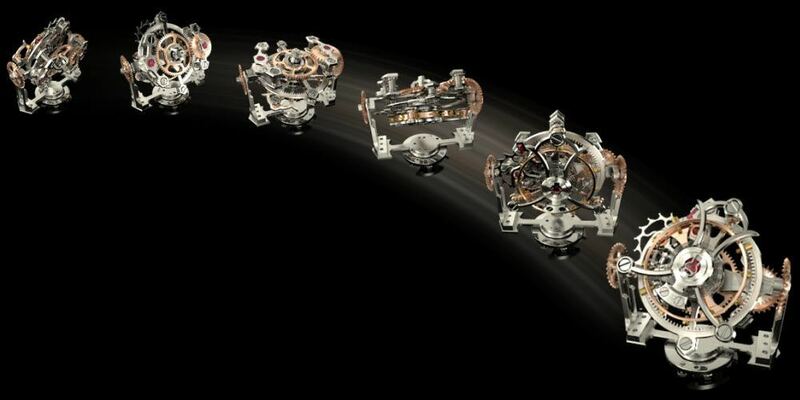 Prior to and during the Quartz Crisis, tourbillons were found in vintage or antique watches. Girard-Perregaux constantly exhibited the antique tourbillon timepieces – specifically, the Girard-Perregaux 1884 patented “Tourbillon with three gold bridges” design. However, in 1980, long before tourbillons were an accepted current watch mechanism and while most people were donning quartz watches, Girard-Perregaux decided to recreate 20 pieces of the original 1889 “tourbillon under three gold bridges design.” One tourbillon pocket watch and 1500 hours later, and the start of a new era of watchmaking began. In 1991, Girard-Perregaux incorporated the “tourbillon under three gold bridges” into a wrist watch. 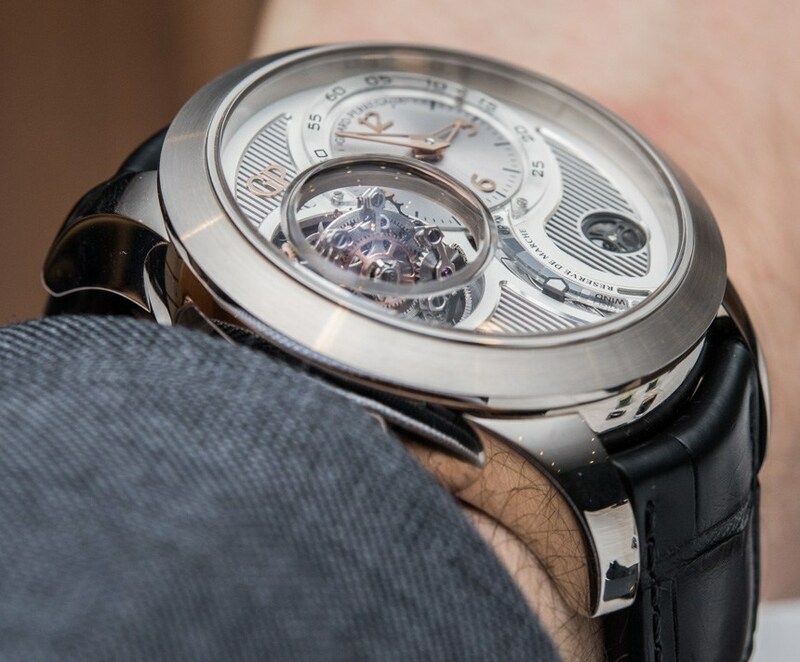 The latest Girard-Perregaux Tri-Axial tourbillon is yet another step into the companies bond with the tourbillon. The end result of the mechanism is hypnotic, to say the least. I can watch it for hours trying to wrap my head around the feat it must have taken to not only get structures to actually fit into one another, but to get them to rotate with precision. One small error can send the entire movement off kilter. However, no “chaos theory” here, Girard-Perregaux is aptly equipped to produce precision. The timepiece is powered by an in-house caliber GP09300-0001 manual wound movement, equipped with a variable inertia balance wheel vibrating at 21,600 Vib/h or 3 Hz and equipped with a 60-hour power reserve. 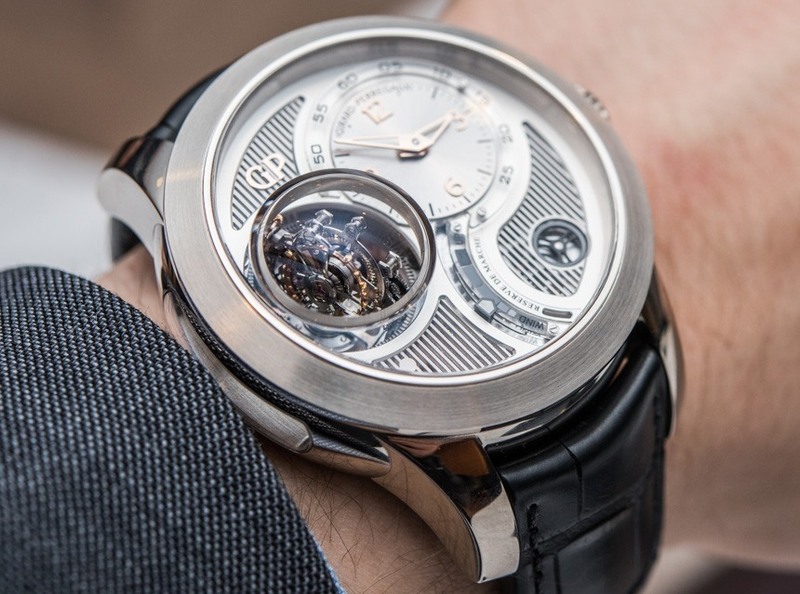 This caliber was specifically designed for the tri-axial tourbillon. At the plate side, the company’s iconic pink gold arrow-shaped bridges are fastened on a smoothly finished modern-looking black plate creating a visual link between the company’s focus on the future and its commitment to the past. Below the traditional rose gold bridges, the word TRI-AXIAL is engraved on a satin-finished circular bridge supporting the differential of the tourbillon. Below that is the rose gold label which indicates the number placement of the watch within the limited edition. The manufacturer’s symbol, as well as “34 jewels” and Swiss GP 9300 is stamped on the black portion of the plate. Turn the plate over and one is greeted with further impeccable beveling as well as alternate satin finishing and circular graining. 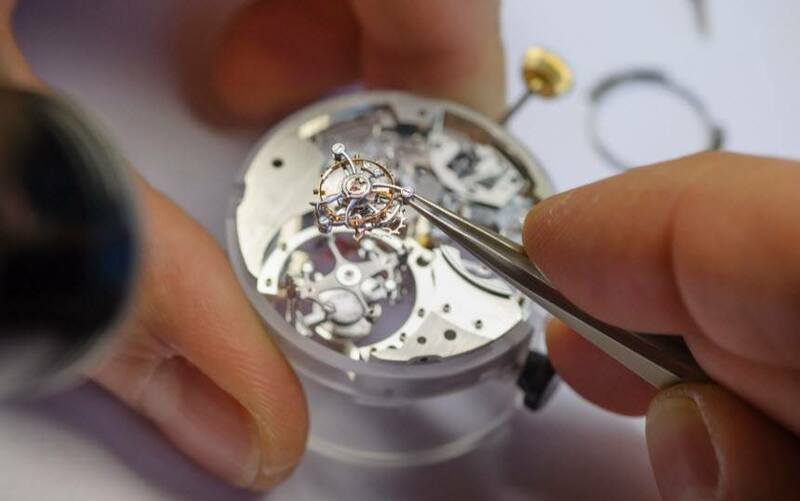 After 160 hours of assembling the 317 movement components, the movement is placed within the case. The timepiece, in its entirety, embodies consistent perfection of the movement, tri-axial tourbillon, dial structure, and white gold case producing another testament to Girard-Perregaux’s haute horlogerie integrity.